I like to try new gadgets and technology out whenever I get the chance, and just like most people, I have an opinion about a lot of different things. This section of the site contains posts that are a review of some kind. 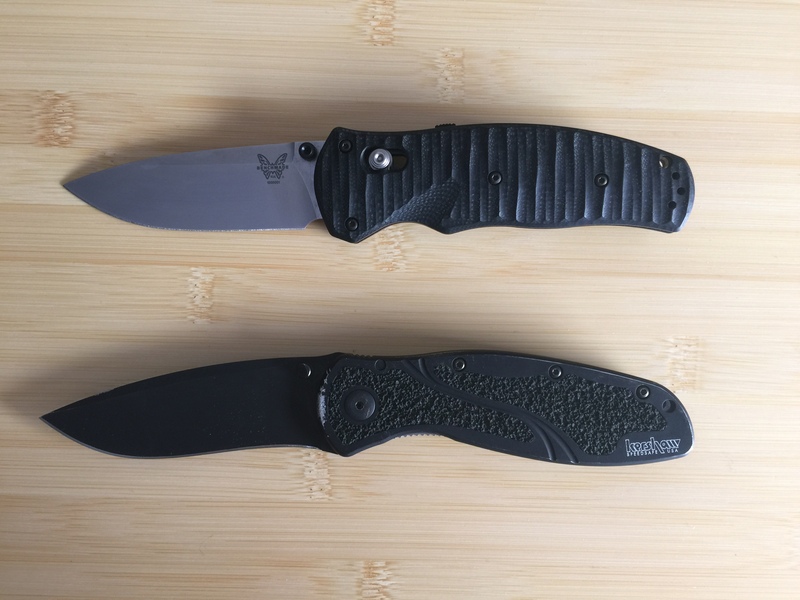 Benchmade Volli on top, Kershaw Blur on bottom. The Volli is clipped so that it sits tip-up in the pocket. The Blur is tip-down, so that’s taking some getting used to. The AXIS lock on the Volli is really nice, and the locking mechanism along the spine is a nice touch — you can double-lock the blade open for heavier work. The Blur has a faster spring-assist, and a more satisfying “clunk” when coming open. I think the sound/clunk comes partially from the aluminum frame (vs the Volli’s “G10” handle, which is some kind of plastic/fiber stuff). The Volli has zero blade-play, which the Blur has a bit. The thumb-stud on the Blur is “one-sided”, and has a bit sharper of an edge on it, which can be good or bad. Because of the slightly wider handle (and thus wider arc to get around it), I find the Volli harder to close one-handed. The straight edge on the Volli’s blade is a big plus for me. The slightly curving blade on the Blur really annoyed me when sharpening it. Handle length is (almost?) identical. Blade is a little longer on the Blur. The Blur is a little heavier . I really like the blade grind on the Volli. The Volli’s blade is a little thinner than the Blur, and is also ground down along the spine to make it appear even thinner still. Since the handle on the Volli is plastic, I guess I won’t be able to use it as reliably as a bottle opener (note the scratched out surface on the Blur, where the blade meets the handle 🙂 ). Overall, I’m happy with the Volli, and will definitely keep is as my EDC (at least for now). I do think that if you could take the Volli blade and put it on something resembling the Blur handle, but keep the AXIS lock, you might really have a winner. 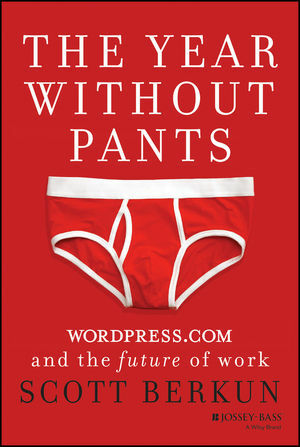 Today is kind of exciting, although it’s been a long time coming so it’s not much of a surprise for me 🙂 Today Scott Berkun, the author of books such as The Myths of Innovation, and Confessions of a Public Speaker, releases his latest book, The Year Without Pants: WordPress.com and the Future of Work. The book gives an inside look at what it’s like to work at Automattic, and to work on something like WordPress.com. Scott was my direct team lead (of the team that I now lead) while he was at Automattic, so the book contains a lot of personal interaction with yours truly. It also happens to be a fun read with a bunch of interesting insights into distributed teams, management, and the open-source-based culture we have at Automattic, and which may well be the future of many more companies. I’ve read versions all the way back to some of the first drafts, and am right now reading the “final” version which I received in hard copy. You should go get it and read it as well. NOTE: I am fully aware that at times in the review below, I sound like a ridiculous book-critic or something. I do not care. Also, links to Amazon contain my affiliate id. A few weeks ago I attended the New York Times‘ TimesOpen Open Source Science Fair on behalf of Automattic/WordPress.com. As part of my “thank you” bag, I got a copy of Ready Player One, by Ernest Cline. I left it on my bedside table in a stack of other books which I’d thus far neglected to start, let alone finish (not to mention all the unopened titles on my Kindle). Timbuk2 Command: Probably the Best Messenger Bag. Ever. Earlier this year, my brother got me a pair of Vibram FiveFinger KSO‘s for my birthday. They’re pretty freaky. Here are some random notes on my adventures with these shoes.